Did you know that there are a hundred and four dining options in Chicago’s O’Hare international airport? If you are flying anywhere — to Minneapolis, to New York, to Paris — you can dine at one of one hundred and four different places in the five terminal airport. This is insane. There should be a hundred and four McDonald’s in the O’Hare airport and nothing else. I am never more bummed out than when I see restaurants in airports. And I’m not talking “Chili’s Too” bummed out. I’m talking places called stuff like “La Tapenade” or “Wicker Park Seafood And Sushi.” What are you thinking, eating sushi at an airport? What are you thinking, eating a caprese salad at an airport? You’re about to fly for several hours in a dirty sky bus, but you need a crepe first? If you have heard of restaurants and been to restaurants, you should go to them when they are anywhere but inside an airport. I have tried a Wolfgang Puck Express in my day, of course, I am not “above it,” but I just feel sad and weird after. Here I am at the Wolfgang Puck Express, a restaurant that only exists in airports, pretending I am not at an airport, but in fact, at a real restaurant. Food at an airport should not be consumed at a table with very high chairs while you are forced to sit upright. Food at an airport should be consumed as you are slouched over in a terminal upon learning your flight has been delayed another half an hour. And so, McDonald’s is the great equalizer among us. We are all the same at the airport, no matter what boarding group you’re in. You can eat McDonald’s for any meal of the day at any time of the day. They have more options than you can even dream of. I’m never happier than when I’m eating two hash browns and drinking an iced coffee the size of my torso. This is a portable food. It takes less than a minute to get. When you are eating at an airport, you are eating simply for fuel. You need a quick, carb-heavy meal that is going to knock you out on a flight. You do not need a frittata. McDonald’s is not a meal for all the time and always, but McDonald’s is a hundred percent for airports, the giant hallways of America. Why is there a Jamba Juice at the airport? I drink a Jamba Juice twice a year, when I am so painfully hungover I think I am going to die and ask for an immunity boost. I don’t want to drink twenty-four ounces of melted sherbet before getting on a plane. Yes, I am even advocating against Starbucks in airports. Starbucks at airports have incredibly long lines. They’re somehow more expensive. (I know complaining about the price of a Starbucks drink is very 2007, but indulge me.) Everyone is so mad and so impatient. McDonald’s coffee is twice is fast and one hundred times hotter. It comes in flavors now. 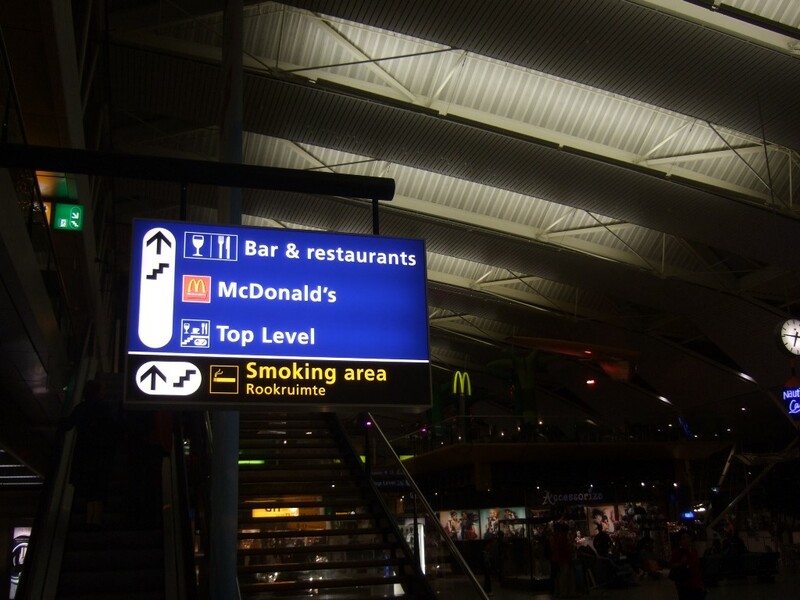 Imagine a paradise where an airport has a-hundred-something McDonald’s. You get your quick meal, you eat it on a weirdly firm terminal chair, you take off in a plane, you land, and you find a restaurant in the city in which you land. This restaurant is good. It’s got all the food you like, and you can eat it in an environment you have total control over. And McDonald’s? Well, it’ll be there, waiting for you in the airport, on your way to your next destination. Fran Hoepfner is a writer and comedian living in Chicago.